Sysessential for TGZ to PST Converter program is a known facility that aims converting email data from TGZ into PST file format with utter ease. The promise of conversion of TGZ data into Unicode formatted PST files is for sure. You can open and view the files prior final migration into PST. Data is saved into newly created PST file. This creates ease of accessing separately into a new folder. The application comes with the option to save data into separate folder for convenience. Software gives an option to save data according to your need into a separate folder. It is a comprehensive application as it converts not onto emails but contacts folders, calendar, tasks, etc into PST file. Software works miraculously even when Zimbra is not installed on your PC. You can look up for converting TGZ files from any of the Zimbra versions with ease. The tool is supportive of all Zimbra versions. However, it is noticeable that Zimbra file is needed for migration and not Zimbra installation is a prerequisite. It is beneficial for choosing free of cost trial edition for knowing deep inside about the software. By downloading the application in free of cost trial run, you can better decide for purchase of the tool. The trial run can migrate first 10 emails from every item. This will let you precisely know how software works. The email migration utility never ever causes data loss scenarios. It carries out email migration task in the swift and best manner. In fact the process is explained in the screenshots given on the main website. This will initialize in making hassle-free data migration for fulfilling the email conversion need. There is a support for batch conversion. You can export entire TGZ folders at one go. This option saves precious time so not to worry and simply enjoy fast conversion techniques. In order to migrate emails from TGZ into MBOX, Software makes use of instant functioning. The application is supportive of performing easy migration thus get connected with the tool and carry out smooth email migration for long term benefits. Bulk Zimbra data exported into PST without any complications. 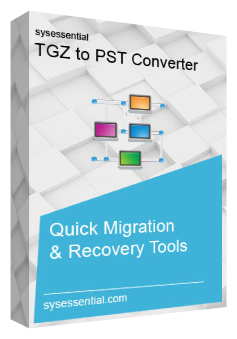 Sysessential for TGZ to PST Conversion application comes with the ability to migrate data safely into PST file format. Users are not required to struggle with virus infected data as safety is the prime concern for software developers. Is there any need to install Zimbra app for data export? No, there is no requirement for installing Zimbra. If you have got TGZ emails with you then this much is more than sufficient. This will help you to perform data export from Zimbra to MS® Outlook. Is it compulsory to install Outlook to run the application? Software fails to run and provide effective results if Outlook is not installed on your PC. Ensure that Outlook is installed and configured with POP3 a/c then only tool can run. Another noticeable thing is that application is supportive of Outlook editions such as 2010, 2007, 2016, 2013, or 2003 in 32-Bit. What is the process of export TGZ to PST? Many a times, user is not comfortable with direct use of the software and this is the reason, free of cost trial edition is recommended. If you are eager to know how tool exactly runs then download the application in freeware mode and test the functioning of the application in advance before the purchase of the application. This gives you fair chance to discover features and working of the tool in advance before buying the tool. What is the purchase process of software? The purchase formality is cleared out through support team guys. You can call at the helpdesk and catch the actual way to get done with the buying formality. You can acquire any details such as cost of the software, formality for making payment and so on. Yes, this application is absolutely safe to work with. It supports converting all the email data into PST files of MS Outlook. If you want to make purchase of the tool and wanted to migrate emails even if you do not possess technical skills then sure you will receive best results. I used Sysessential for TGZ to PST Converter to migrate Zimbra emails into PST file format of MS® Outlook. This is a known application that migrated all the emails swiftly into PST file format and today I am able to access emails safely into Outlook. It has some of the excellent features which are not available in other email migration solutions. Its proposition for instant data migration, data safety, and so on helped in making data convert easy and hassle-free. There is no other application better than Sysessential for TGZ to PST Converter. It has changed my attitude towards third-party tools. The single tool is powerful enough to migrate thousands of emails, contacts details, and calendar into PST file format. I am really thankful to software developers for producing such a flawless utility which can migrate data swiftly into PST file format.